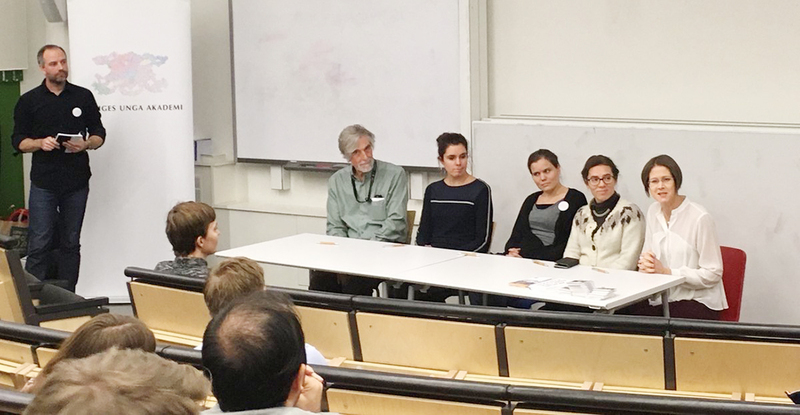 The third career seminar on the Academy's tour took place at KTH Royal Institute of Technology on 15 November. KTH PhD Student Chapter and KTH Relocation co-hosted the event. Many young researchers in the audience expressed concerns regarding insecure employment and uncertainty about the rules that apply. Young Academy of Sweden (YAS) works to strengthen the voice of young researchers in the research policy debate. The career seminar at KTH is part of a tour where the Academy teams up with universities across Sweden to shed light on career and development opportunities. Robert Lagerström, Associate Professor in Information systems architecture at KTH and member of YAS, highlighted the pressure on young researchers to not only deliver top results in their research area but also to know how the bureaucracy around different forms of employment works, and furthermore these rules are often changed. At the panel talk, moderated by Robert Lagerström, several of the panelists underlined the importance of having support and a network, at the stage before acquiring permanent employment. Josefin Larsson was elected member into YAS earlier this year. She encouraged young researchers to be active and talk to senior colleagues to understand how career systems work in practice. It often differs between universities, for example regarding the different funding available to apply for. The seminar attracted about 60 participants and was fully booked long before the registration deadline. There is a significant need to raise these questions and address career issues. Young Academy of Sweden arranged a career seminar at Uppsala University and another at SLU earlier this year, and will be arranging yet another at Linköping University in the spring of 2018. The Academy welcomes the fact that during this fall, the government introduced a new form of employment within the academy. It is a time-limited employment that gives “Biträdande Lektorer” (BUL for short) the right to be reviewed for promotion to “Lektor” and permanent employment. A change promoted by YAS.